Guest host on Friday is A.S. King, who will lead the spirited discussion, “An Hour of Rebellion With A.S. King.” Although her books are shelved in the young adult section, King doesn’t write for a specific age group. “I don’t write my YA for teenagers alone. I write them for families. The father can enjoy it as much as the kids,” says King. She’s eager to share what she sometimes refers to as “writing with the middle finger” with #litchat. King’s second novel, Please Ignore Vera Dietz, launches on Tuesday with an eager audience of mixed ages awaiting. 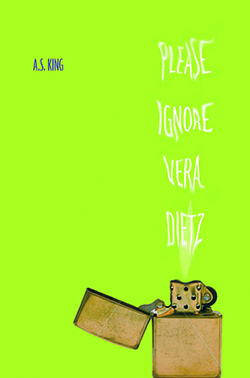 In Please Ignore Vera Dietz, King ignores teenage angst and points instead to abuses of physical, chemical and emotional. It’s a powerful book about facing personal demons, both past and present, and doing the right thing in the midst of grief. A.S. King’s short fiction has appeared in many print and online journals and has been nominated for Best New American Voices. Her first young adult novel, The Dust of 100 Dogs, was published in February 2009 and was an ALA Best Books for Young Adults pick, a Cybils Award finalist and an Indie Next List pick for teens. 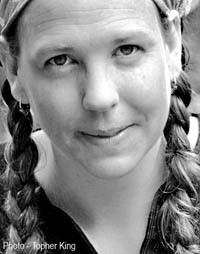 Her next novel, Please Ignore Vera Dietz, is due in October 2010 from Knopf, and her third, Everybody Sees the Ants, will come a year after from Little, Brown. Follow A.S. King on Twitter at: @AS_King.